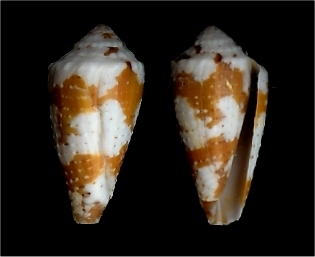 Conus pseudoaurantius Vink & Cosel 1985, is usually found in the "Grenadines" (West indies). I personnally collected live specimens of Conus pseudoaurantius when I traveled to the "Grenadines", down in the Tobago Keys. Habitat is hard reef, on sand and coral substrata. Animal is bright red colored. They could look like small Conus aurantius but really seem to be a valid specie. Both specimens shown here wereself-collected in the Tobago Keys recently (2000-2002). The specie seems to be uncomon there. 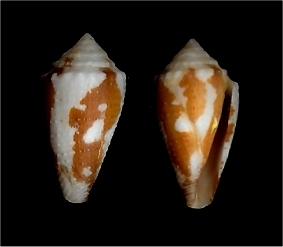 When I arrived in Martinique in 2000, I found on the Atlantic coast (which is rarely visited for shells), near the shore on coral and sand substrata a small shell which I named as juvenile Conus regius Gmelin, 1791. The animal was bright red colored, very different from Conus regius in fact, but at the time I was not enough skilled in Carribean Cone Shells to realize this. 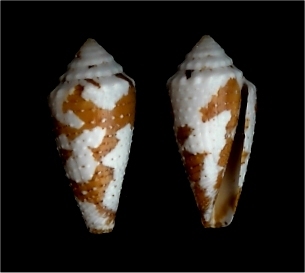 Later while I was studying my shells and after having been to The West Indies I started to realize that It could be linked to Conus pseudoaurantius which has same animal color… maybe also a juvenile of C. aurantius (I never found this specie live). C. pseudoaurantius or C. aurantius ?